David has sub-specialty expertise in vitreo-retinal surgery, medical retina and cataract surgery. He has sub-specialty training in both medical and surgical retina and is active in clinical and basic science research. 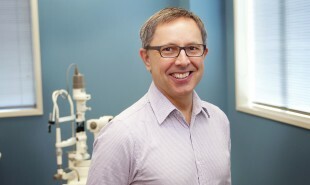 David trained in Medicine at Auckland School of Medicine and in Ophthalmology in Auckland, Hamilton and Bristol, England. He undertook higher training as Retinal Fellow at Bristol Eye Hospital and Bristol University. He returned to a consultant post at Waikato Hospital Eye Department in 1991 to introduce vitreoretinal surgery and sub-specialty medical retina to the Waikato. Outside of Hamilton Eye Clinic, David is a visiting ophthalmologist in the Department of Ophthalmology, Waikato Hospital. He is also a Clinical Senior Lecturer for the Department of Ophthalmology, University of Auckland and a Researcher for the Department of Physics and Engineering, Waikato University (research into computerized retinal image analysis). David is very actively involved in research into retinal degenerative disease, in particular macular degeneration and has received several funding grants for his work. He has research appointments with two Australian biomedical companies and is also a research or medical advisor to several international biomedical, surgical and pharmaceutical companies. In 2014 David became a Trustee of Macular Degeneration New Zealand and is very involved in furthering seeking to improve access to treatment and education for this country’s leading cause of blindness. Through Volunteer Ophthalmology Services Overseas, David has provided sight restoring surgery in communities over the Pacific – in Samoa, Tonga and Fiji. At Waikato Hospital David is involved in the training of new generations of ophthalmologists and a past member of the Qualifications and Education Committee of the Royal Australian and New Zealand College of Ophthalmologists. David is a member of several ophthalmological societies including Oceania Retina Association and Australian and New Zealand Retinal Specialists Association. He is a past Secretary of Save Sight Society of New Zealand. David finds that the retina sub-specialty has many rewards. Retina is undergoing an exciting period of rapid advancement with new knowledge, new techniques and technologies. For example, since 2005, blindness from macular degeneration has reduced by 30% due to new treatments. When not at work, David enjoys spending time trout fishing in the Waikato or sea fishing and diving in the waters of Mercury Bay. He also enjoys tramping and skiing. David is married to Julie and they are proud parents of two adults.